Experience the legendary warm Arabian hospitality on the historical shores of the Arabian Gulf. 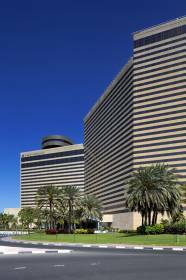 Hyatt Regency Dubai combines a sense of tradition with modern conveniences to offer travelers a relaxed stay in the heritage heart of the city. Offering stunning sea view, the hotel’s 421 elegant guestrooms & suites provide a space to work, play or relax in a calm atmosphere. Unique dining options are presented in a warm, energized ambience. Flexible Meetings & Events area and extensive recreational facilities are complemented with an incomparable level of personalized service. Hyatt Regency Dubai is a place for guests to connect with what matters most to them. Welcome to endless possibilities for hosting Meetings & Events at Hyatt Regency Dubai.Presenting 4000 Sq. M. of sophisticated and flexible Meetings & Events space coupled with an incomparable level of personalized service. Attendees can re-energize with customized food & beverage offerings by creative chefs, while the organizers can experience smooth planning and hassle-free preparation by professionals. A perfect venue to host a conference, an exhibition, a product launch or a spectacular gala dinner.